Some books enrage me by including no back story-explaining recap page, while others... well, they carry the concept a bit too far. 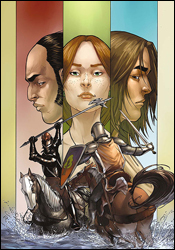 Hedge Knight II is a good example of the latter, devoting two lengthy paragraphs to a detailed history of the series and the family tree of most of its cast. Fair enough, I guess. Given the choice, I'd rather be in the know than in the dark. The book's lead character, Dunk, is a knight-for-hire, roaming the countryside with his squire, Egg. After the death of his master, Dunk took up the old man's sword and shield, dubbed himself Ser Duncan the Tall, and set about making a name. It wasn't long before he'd enraged the land's prince, gone to trial and fled the land. Now residing in the countryside, in the service of the retired Ser Eustace, Duncan and Egg find themselves once again at a point of conflict. Despite the verbose introduction, George R. Martin's storytelling is a very easy read, nicely paced without getting too caught up in the Olde English dialect. With a few exceptions near the end of the issue, no word balloons drag on for longer than they should, and everyone gets a chance to deliver a big line or two. Martin creates strong characters with obvious pride and distinct motivations, and while you won't be pulling for all of them, you'll at least understand where they're coming from. His cast is deep and well developed, but not overly complicated or full of hot air. It's a nice, quick read but that doesn't mean it's without substance. Martin takes great care in explaining the particulars of a medieval battlefield, enlightening the reader while keeping up a brisk pace. When Duncan duels with another knight early in this issue, both men's strategies are concisely laid out before the first strike is thrown. If that sounds like an unnecessary level of detail, it isn't. The writer manages to explain everything an unfamiliar reader would ever need to know about the fight quickly and concisely. It deepens your understanding and appreciation for these aged arts, and without their presence, the battles would quickly regress into stereotypical melees. Ben Avery's artwork is a decent counterpart for that meticulous, yet simple attention to detail. His pages are largely kept simple and stylized, but clearly a lot of effort was made to retain the authenticity of each knight's unique suit of armor and the civilians' manner of dress and posturing. His linework is generally very good, detailed when it needs to be and clean when it doesn't, but he doesn't bring a lot of excitement to the table. Even during the issue's more explosive scenes, I didn't find myself overly enthused... it's more of a document of events than an exaggeration of an action scene. He has a gift for denoting each character's personality in their faces, which is a bit of a rarity among modern artists, and helps further highlight the depth George Martin has poured into each of them. Avery has problems with his storytelling, though, particularly during battle. There were several instances where, despite the writer's descriptions, I wasn't quite sure what had happened, and I have to blame the artwork for that. Hedge Knight II is worth a good look. I'm not typically one for stories set in the middle ages, but I'd be willing to make an exception here. The book isn't without its flaws, particularly on the artistic side, but it's worlds better than I expected when I first laid eyes on it. Borrow this from a friend if any of your friends have actually bought it. It's solid enough.